I am not quite sure how to feel about this book. Aside from the first and last page, the "story" is actually a speech given by Chief Seattle in the 1850's. Though the words are quite poetic, at the end the illustrator herself says that they are not perfectly quoted. Though I found this under "Easy Reader" in Thorndike Library, I am not sure young children would initially understand it's message or want to pay attention due to the style it's written in (it's something not written towards an audience of children to begin with). It could act as a good starting point to open up conversation/questions/further research in social studies/history pertaining to Native Americans. The illustrations in this book are very well done, however some of the imagery depicted as well as the note from the illustrator at the end left me questioning the intention of the book. In my opinion, it almost fetishized and romanticized Native American culture to a point that's disrespectful. Jeffers also talks about the Native American people in her conclusion as though they are completely a people from the past, with none surviving today. To an extent, it seems as though she's using this story out of context for Caucasian-centric environmental propaganda. I would not go out of my way to get this in a library collection because there are other books and educational materials that can be used for the same purposes, and do so in a more tasteful way. This could be an interesting book to discuss at the middle school, high school, or even college level, though. 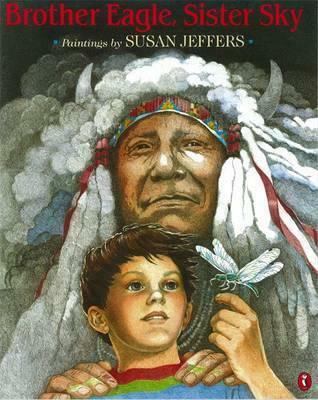 Author, Susan Jeffers, wrote Brother Eagle, Sister Sky with an environmental theme in mind. I believe that her purpose was to pay respect to Native Americans and their connection with the land. With that said I feel that Jeffers missed the mark with this text and contributed to furthering Native American stereotypes. Jeffers’ illustrations perpetuate the Indian stereotype by including images of people dressed in feathers, headdresses, and fringed animal skins. In addition, Jeffers does not distinguish dress or customs between tribes represented in the text. I would not recommend using this text in our outside of a classroom. While it may have a moving environmental message in it, I am sure other texts could more appropriate deliver the message. This extremely inauthentic book is loosely based on a Native Chief, Seattle about respecting the earth and how important it is to respect the earth. Yet even on an elementary school level I would pair this book with a full picture of native life as well as the current situation for many Native Americans in this country. What a beautiful book. Every person living on this earth should read it. This book is often used in classrooms as an example of environmental writing for children and as the haunting, poetic words of a Native American leader. However, the book has also been criticized. One of the biggest criticisms of this book is the charge of inauthenticity in the words of Chief Seattle. In an end note, Jeffers says she adapted the letter of Chief Seattle as it is quoted in Joseph Campbell’s The Power of Myth, pages 32-35. It is possible that Campbell, and then Jeffers, copied a fictional version of Seattle’s words that have come to be accepted as truth, even among some Native Americans. According to one critic, "The National Archives, the Smithsonian Institution, and the Library of Congress each year receive numerous requests for the original text of the statements attributed to the old chief. The United States Information Agency has received similar inquiries from persons and institutions in many foreign lands. Unfortunately, no one has been able to locate either the letter or a reliable text of the speech.” (Clark, Jerry L. "Thus Spoke Chief Seattle: The Story of An Undocumented Speech" Prologue Magazine, Spring 1985, Vol. 18, No. 1)There is an additional problem with the illustrations in this book. Although Seattle was Suquamish and Duhamish, from the Puget Sound area, the illustrations feature Indians on horseback who appear to be Plains Indians, and indeed the jacket states that Jeffers “consulted with Native Americans, especially with members of the Lakota Sioux Nation, who also inspired many of the paintings for the book.” There is no explanation of why Jeffers chose to use drawings of Lakota Sioux Indians to illustrate a speech attributed to a Northwest Indian, but the illustrations, while beautiful, add to the feeling of inauthenticity. It is interesting what one discussion about a book can do to your own perceptions. I had readthis book as a student many years ago and enjoyed it, yet returning to it now I find myself feeling slightly uncomfortable with some of the content, especially after reading articles from Paul Chaat Smith ( a member of the Comanche Nation of Oklahoma) and Jean Mendoza/Debbie Reese.The story itself is very well meaning and, having taken an amended speech (by Jeffers) from Chief Seattle, it talks about the need to preserve and respect the land which we take for granted. It tells the story of how the Native Americans have lived in harmony with the land AND Jeffers also lets it be known that it was the white settlers who began a 'bloody war' in which they claimed the land for themselves: all well meaning and important to share. But the ending, which sees a white family planting seeds in order to regrow parts of the forest which had been cut down (with the blessing on the Native American people who stand behind them) sends mixed messages and who owns the land and how both the Native American and White American people are (or are not) a part of this.The main problem lies with Non-Native writers taking words from Native speakers and using them for their own purpose around a message which may have little to do with the original. The key element that had grated on me and I began to understand after reading the articles mentioned above relates to the presence of the white boy on the front cover and the white family at the back. Whilst they are corporeal and the Native Americans being incorporeal which I find difficult to handle since, as Reese and Mendoza point out, it sends out a sense that these people no longer exist. Something to think about. This is quite an interesting read and quite a lovely illustrated one to boot but one with very low reviews. Although some of their opinions do make sense there is also a bunch that ends up confusing me in their complaints against the book. First of all the compiler did take creative license in using only bits and parts of the speech of Chief Seattle to fit the story while adding other parts of his family telling him the information. She also chose to leave out any religious references from the original speech to make this more geared towards a spiritual yet also environmental outlook, which was also an outlook of the actual usage of land. Although the right tribe may not have been used by the illustrator as well for the book's paintings the artwork is breathtaking. The details are rich yet subtle while providing a beautiful portrait of the world being connected. What makes it more interesting is that when you look at the picture you can find some other things you hadn't seen originally in the artwork. For all its controversy I think the book did a great job to bring some of the strongest words of wisdom from Chief Seattle to the people who were and are still going around destroying the sanctity of nature. Like many books based upon great words there needs to be an understanding of the original work so maybe a shared telling to crowds such as printing off and tucking within the pages the actual "letter" and then being able to read the book afterwards. And always, always, try to research more information for yourself instead of getting mad at the people who are trying to bring little known information to the rest of the world who may not hear it otherwise. NOPETY NOPE NOPE.a) Native peoples haven't disappeared, despite the best efforts of the US and Canadian governments for centuries.b) Did you seriously illustrate a book about Chief Seattle (who's Duwamish) with pictures of gd Plains peoples? That's like writing a book about Leif Erickson and putting him in a fricking beret and striped shirt.c) I can't handle yet another book pitching Native peoples as having some mystical connection to the earth/animals. They're just people, and relegating them to "closer to nature" isn't fair or right. It's important to note that there are Native authors, athletes, teachers, truck drivers, scholars, doctors, and every other field out there, Native folks live in our contemporary times and in our society. Don't limit them to a lifestyle that's extinct. Echoing Chief Seattle’s humbling and inspiring words in a paraphrased form, Jeffers’s picture book has drawn criticism for its accuracy. She explains how Native Americans saw a harmonic union between man and the natural world. Nature itself is suffused with a great spirit that flows within the beauty of everything and also into the ancestral past that is carried on through human memories. For the artwork, Jeffers uses a painterly combination of a fine-line pen with ink and dyes. She uses an array of soft hues and thin lines to bring a meditative mood to the book. Her illustrations envision the rephrasing of Chief Seattle’s sage words into double-page images, which show reverent ways of cherishing nature’s exuberance. These illustrations press the need for stewardship and protecting of the land so that it can be passed on to future generations. On my initial read of this book, I enjoyed the message immensely. It imparts a love of nature to the reader in a way that child from age 4 or 5 on up would understand. I also found the illustrations beautiful - they captured the pacific northwest perfectly. My appreciation for this book altered significantly after reading several reviews. It turns out that the "speech" by chief Seattle was never actually given, and in fact was created by hollywood. Also, the dress that the Native Americans are depicted as wearing are not accurate at all, and some illustrations are blatantly copied from other pieces of art. So disappointing, and a perfect example of how difficult it is to know if something is authentic. Tries too hard to be organic/natural in its plea for environmental friendliness. It's almost as if the author wanted to write a book about saving the planet's resources and thought that having it told by a Native American would make the message more powerful. Further burdening this book are the controversies regarding the transcripts of Chief Seattle's speech, the accuracy of the cover and other illustrations, as well as the manner in which people are depicted. The images in this book were awesome, but the story itself was very simple and not constructed very well. When I read it, it seemed somewhat unrealistic. However, after discussing some of the issues with the class, I was only partially correct in my original analysis. This story is extremely biased and bears little truth with it. If an author is going to write some historical document about an authentic group of people, they must ensure that their research is in fact authentic. This is one of my favorite kids books! The famous words that are attributed to Chief Seattle are illustrated beautifully in this children's book. But here's the best part: there are faces hidden in the rocks and trees, and it's a lot of fun looking for them. Summary In this captivating book we discover just how important earth is, especially to the Native Americans. It explains the value and we respect we should have for nature. Evaluation I gave this book 4 stars because it had a great message for students and amazing illustrations. However, at the end it states that it is loosely based on Chief Seattle's speech therefore making it somewhat inauthentic.Teaching Ideas I would use this book to teach my students some of the core values most Native American tribes had. It also would keep my students engaged because of its very detailed illustrations. Another idea would be using this book for a poetry unit since it has sort of a poetic feel when you read it. Beautifully written and illustrated book. The story is driven by both the text and the illustrations. The book makes you ask yourself the question of "What can I do to preserve the Earth and all the things that make it beautiful." Love this book. I use to read it to my students every year. I found it again while on vacation. This is a retelling of Chief Seattle's words about our earth. Everyone should read this story. The illustrations are perfect. The book as a whole is just a great idea. This picture book contains a message from Chief Seattle ( a Native-American) who describes the land as it should be, before signing it over to the White man.Genre: Historical non-fictionI found this book to extremely interesting as the message by Chief Seattle within this story, still holds true today. I also believe that children will find it interesting. In a world where we are just now starting to become environmentally aware, Native-Americans had been for centuries. This message was delivered over a century ago, and will still make the reader question his current take on the environment whether they are in the 2nd grade or an adult. There isn't a rich thick plot, however Chief Seattle does provide a solution to the dangers that could ensue from his land being taken. The character was convincing as he was a real person, and the story and language were appropriate for a child's age and interests.The paintings contained within this book were extraordinary! They were beautifully detailed as they fit well with the story line. They helped to keep me engaged! I think the main reason that children will love the paintings is that they help to convey the type of lifestyle that the Native-Americans lived; simple, peaceful and beautiful.We see mostly White characters in picture books. I do enjoy seeing diversity in books, as this one prominently displays. Chief Seattle is so genuine and embodies everything we would expect from the culture. Within the books were the actual words of Chief Seattle which allows us a window into their culture during this time period. This story is a lesson in itself and gives the warning that we must not take things for granted. Lets take the words of Chief Seattle and apply them to our own lives. He said "We did not weave the web of life; We are merely a strand in it. Whatever we do to the web, we do to ourselves." This book does a pretty good job of dispelling the myth that native American Indians were ignorant savages. It is presented as a speech given by Chief Seattle where white settlers were effectively annexing Indian lands. It is an eloquent speech where Chief Seattle implores the white men to take care of the lands so they can continue to be enjoyed by generations to come. It shows that the Indian attitude toward the land and resources was much more than a quaint superstitious or religious belief. These people were way ahead of the European settlers in terms of understanding the inter-connectedness of everything in nature.To be fair to critics, there is some controversy about whether this is a literal translation of Chief Seattle's speech or whether it was actually composed by more recent writers. One bit of "evidence" that it was not a word-for-word translation is the line about "What will happen when the buffalo are all slaughtered?". Chief Seattle lived in the Pacific Northwest where there were no buffalo. Still, it is widely agreed that Chief Seattle did make this or a very similar speech at the documented treaty signing.This makes a good read-aloud book when students are studying native American Indians or when they are learning about environments and ecosystems in science. I can understand all the mixed reviews that exist for Brother Eagle, Sister Sky.... When looking at the Susan Jeffers intent of the story, I think she paints a nice picture on how "All things are connected like the blood that unites us." I can understand where some of her critics have criticized the accuracy of the story but she does point out on the final page that she adapted Chief Seattle's message. I took this adaptation to serve as inspiration for this story. I did find fault with the images that Jeffers uses in this story. She makes it sound as though Native Americans are an "extinct" breed of people and that it is up to the white man to carry on the tradition of uniting man and nature. The lasting images in this story are that of a white man with his children planting trees and the ghostly images of Chief Seattle and a native woman with a baby in the background. Was Jeffers trying to say that we (white America) must carry on Chief Seattle's message? I believe that her messages would have been stronger served if someone of Chief Seattle's decent had learned from his words and was using them to inspire and educate others. This is a wonderful story of Chief Seattle's message to the European settlers. Chief Seattle's message is focused on preserving the land, and expressing his deepest appreciation and love for nature, animals, and Mother Earth.The illustrations are absolutely phenomenal in this book. They are full of bright colors and vivid details. I have used it in my classroom as a silent picture walk, and I have had students brainstorm words they think match the picture. The attention to detail and clarity in the illustrations really shows the value that Native American people put on nature, animals, and Mother Earth.The book ends with a short expository essay on Chief Seattle and his battles throughout his life. It explains the background of why he was giving this speech, and how he felt about it. It is a very powerful text to use even with young students. It takes a bit of explaining for students younger than third grade, but it is worthwhile! Students will be captivated by the images and story over and over again. In Brother Eagle, Sister Sky (1991), Susan Jeffers has adapted Chief Seattle's famous speech to the new Commissioner of Indian Affairs for the Territory with regard to the government's offer to buy the lands of the Northwest Nations. Her beautiful paintings illustrate the beauty of the land and sadness of the native peoples over the loss of this land. Chief Seattle's words provide a warning to all who read them to take care of the earth before we cause the "end of the living, and the beginning of survival. "Themes: Stewardship; Nature; ResponsibilityWays to use this book with children:*Read during a study of Native American tribes. *Do a soil erosion experiment to show what will happen to the land after the deforestation shown on pages 17-19. *Using yarn, create a giant web with each student holding on to a part of the yarn. Show what happens when one person pulls on the yarn (effects are felt everywhere). Show what happens when one person drops out of the web (loss of species). I love how this author mentions in the first part of the book, the history of the Indian tribes and how they got here. This strategy is great to tie in readers and encourage them to know more about the Native Americans culture and history. Did I mention the artwork is awesome! The first page is kinda bland, but as soon as you flip the second page you will be amazed. The whole is nothing but traces of color and spread out thru the whole page. I love knowing how the Native Americans tie in their culture with nature. Nature is the key to everything and how Natives live in the prairie lands. I find it very interesting for two of the pages I read, I found a hidden faces in the illustrations. The ending was beautiful. The author writes, "Preserve the land and the air and the rivers for your children's children and love it as we have loved it." Treat nature as if they were a person; love, cherish, and pass on. If you want history, cherishing nature, and beautiful sketch drawings; I recommend this book! Annotation: A story of Chief Seattle’s message about the earth, sky, and nature as a part of our life, blood, and breath and preserving life by honoring the land, sky, and water. Review:Beautiful illustrations tell the story of Native people’s values and belief that the earth, land, and sky, deserve respect and honor because they sustain life. The powerful words in this story are not Chief Seattle’s actual response to the U.S. Commission of Indian Affairs offer on purchasing the land from Native people. This story provides a lesson for all about protecting the environment, respecting and honoring the earth and sky. I recommend this book as good read for elementary children. Although the illustrations do not specifically represent one distinct American Indian tribe, the values of respect, honor, and love for the earth, sky, and one another do represent the values of many Native American tribes. Growing up, I only learned about Columbus and the colonists' point of view. I was rarely exposed to the Native American's point of view and their suffrage. This book exposed me to the pain, suffering, and the losses the Native Americans faced when the settlers arrived in the Americas. This story involved a young boy who is told stories orally about what their ancestors went through. The illustrations are very detailed and really catch the readers eyes. This book would be great for stronger readers in the 5th grade or so. Brother Eagle, Sister Sky would provide the students an insight of what the Native Americans faced. In addition, this is an excellent example of orally told stories. Even on the cover of the book, it says, "A message from Chief Seattle". Also, in this story, it is evident that the Native Americans treasured the nature and everything that mother nature has to offer us. Therefore, this story could create a sense of appreciate to our environment. I found a copy of this book at a thrift store and added it to my children's picture book collection. The artwork alone earned it a 5 star rating from me, though that approval is not without some qualifying footnotes. The pen and ink images are gorgeous, absolutely gorgeous, though they depict an historic Lakota Plains lifestyle and not that of Chief Seattle's nation. It is disingenuous to say that Chief Seattle is the author of the text, though perhaps it was inspired by a speech he gave upon being forced to cede his land. The book also seems to suggest that Native Americans have vanished into the mists of history--which is absurd--but which suits the doomsday warning tone of what is essentially written as an environmentalist call-to-arms. The problematic aspects of this book, I believe, are great opportunities to have deep conversations with kids about uncomfortable topics.